When I was a teenager, I made a solemn vow that, should I ever become a parent, I would never, ever, ever tell my kids to “turn down that noise!” Flawed human that I am, I have failed to fulfill my share of resolutions and have, at times, fallen short of my self-expectations. It is, thus, with all due modesty that I express a modicum of pride in having steadfastly upheld my pledge to refrain from criticizing any of the music favored by my children. Though my parents’ appreciation of music stopped short of embracing genres such as jazz, blues, folk, country, or (gasp!) rock, their love of the classical repertoire, opera, musical theater, and liturgical music were formative, if by no means, exhaustive. To their dismay, I developed an early, and enduring, affection for the Rolling Stones. I enjoy the blues every bit as much as the blue bloods of the classical repertoire. I’d be hard pressed to say which gives me greater satisfaction: listening to Haydn’s Symphony #22 in E-Flat­ Major – it must be the recording performed by L’Orchestre de la Suisse Romande, conducted by Ernest Ansermet – or listening to Bobby “Blue” Bland’s Stormy Monday (with Wayne Bennett on guitar). While my musical taste is eclectic, I admit to knowing relatively little about Country Music. I like it. I’m just not particularly well versed in it. Therefore, to help address this cultural deficiency, my wife and I decided to vacation in Nashville, Tennessee – a place that neither of us had ever visited. And having just returned, I can relate that while our entire stay was thoroughly enjoyable, my two peak experiences consisted of a tour of the Ryman Auditorium and a performance at the Grand Ole Opry. The Ryman Auditorium was originally intended to be constructed as a venue for popular entertainment. When, however, its principal benefactor and namesake, Thomas Ryman, experienced a religious conversion at a revival meeting conducted by Samuel Porter Jones, he ended up building what was to become, upon its completion in 1892, the Union Gospel Tabernacle. Though the edifice was used, principally, as a house of worship, it was often rented out to help pay off its debts. In 1904, an enterprising woman named Lula C. Naff began booking various events – concerts, speaking engagements, magic shows, etc. – at the Ryman. By 1920, she had become the Ryman’s fulltime manager, and the building had transitioned into a vital center for the performing arts. In 1943, Lula Naff brought the Grand Ole Opry – a radio show featuring a variety of country music artists that originated in 1925 – to the Ryman, a move that was to cement the venue’s identity as the “Mother Church of Country Music.” Once home to the Opry, the Ryman became the nation’s pre-eminent stage for showcasing established Country stars, and launching new talent. Over the course of the following 31 years, every one of the Opry’s weekly live radio shows was sold out. In time, the Grand Ole Opry required a larger, more modern home. The Ryman Auditorium (which has since been refurbished, and remains a coveted performance venue) lacked air conditioning, backstage facilities, and other amenities expected of contemporary concert halls. Thus, in 1974, the “Grand Ole Opry House” was completed on a plot of land northeast of downtown Nashville (where the Ryman is located). As is true of the Ryman, the seats in the “new” Opry House remain pew style, though the Opry House benches are cushioned. Every Tuesday, Friday, and Saturday evening, from March through November, the world’s longest, continuously running radio show is performed live, on the Opry House stage. And a week-ago, Tuesday, my wife and I were there. We saw a wonderful show that was completely satisfying in its own right. But it was more than that. To be a part of that audience was to become one with a quintessential piece of Americana. And though it wasn’t hard to surmise the prevailing politics of those surrounding us, the show itself was entirely untainted by political quips, jibes, or innuendo. From beginning to end, the Grand Ole Opry was all about the music – songs and strains that spun stories of love, longing, and loss, hope, promise, and faith. It was moving, and it was fun. 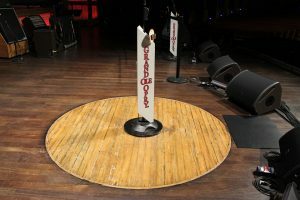 Perhaps the coolest thing about the “new” Opry House is that a six-foot-in-diameter chunk of oak was cut from the stage of the original Ryman Auditorium and transplanted to center stage. It is on this piece of wood, simply known to every country music performer and fan in the world as “The Circle,” that the Grand Ole Opry’s main spotlight shines. It is here that every aspiring Country Music performer dreams of standing. And it is there, to which every performer who eventually realizes his, or her dream pays due homage. To do nothing more than consider the awesome array of talent that has stood on that piece of wood is to open one’s self to something approaching a religious experience. Indeed, to partisans of Country Music, “The Circle” is hallowed ground – a sort of secular, sacred space. Which brings me – yes, at long last! – to a point of connection with private schools. There is but one Ryman Auditorium, and one Grand Ole Opry. And while there are thousands of private schools in California, each has its own unique history, culture, ethos, heroes, myths, collective memories, and “sacred” spaces. Difficult as it may be for each school to fashion its own version of “The Circle,” it is vital to create such symbolic touchstones that connect, affect, and stir generations of students, faculty, and donors. Symbols, rituals and traditions are powerful shapers of identity and community, regardless of whether they exist in religious or secularized forms. When alumni of a school are asked what they remember most about the place, twenty-five years later, you can bet your boots (available from numerous merchants interspersed between the honky-tonk bars on Broadway, in downtown Nashville) their answers won’t have much, if anything, to do with curricular innovations, capital campaigns, test scores, or college admissions. What they will remember is a school’s equivalent of “The Circle,” a symbol, that epitomizes the school’s ethos. If your school doesn’t have its own readily identifiable version of “The Circle,” it’s time to start carving.